New Zealand is an island country located in the southwestern Pacific Ocean. It geographically comprises two main landmasses, the North and South Islands. In 1250-1300, Polynesians settled New Zealand and developed a distinctive Māori culture. Europeans first made contact in 1642. The culture of New Zealand is largely inherited from British and European custom, interwoven with Māori and Polynesian tradition. European and Māori remain the two largest ethnicities, but the large Polynesian population in Auckland has prompted the observation that Auckland is now the largest Polynesian city in the world. In fact, Auckland is the most remote city in the world with a population in excess of one million. The country of New Zealand is currently the 122 most populated in the world. During its long isolation, New Zealand developed a distinct biodiversity. It is a marvelous place to visit and holds many unique experiences. This article will examine 15 interesting places and events in New Zealand. The Kawekaweau is an extinct Giant Gecko unique to New Zealand. It is by far the largest of all geckos with an overall length of at least 600 mm (around 2 ft). The only recorded account of a living Kawekaweau is from 1870, when a Māori chief killed one he found under a dead rata tree in the forests of the Waimana Valley, which are now protected as part of the northern section of Te Urewera National Park. Pounamu (greenstone) is several types of hard, durable and highly valued nephrite jade, bowenite, or serpentinite found in New Zealand. Pounamu almost always refers to nephrite jade and is found in specific rivers on the South Island. When searching for the rock, it can be difficult to identify because it hides in large boulders that often need to be cut open. The Māori people have recognized four main types of pounamu. They are kawakawa, kahurangi, īnanga, and tangiwai. Kahurangi pounamu is the rarest variety and is highly translucent in color. Pounamu plays a very important role in Māori culture and is considered a treasure. It is valued for its beauty, strength, and durability. In 1997, the Crown gave back the ownership of all naturally occurring pounamu to the South Island tribe Ngāi Tahu. Today, greenstone continues to be popular among New Zealanders and is often presented to visitors and people moving overseas. For centuries, large unidentified sea animals have been reported off the coast of New Zealand. In 1968, a carcass washed ashore at Muriwai, on the west coast of North Island. The body was measured at 30 ft (9.1 m) long and 8 ft (2.4 m) high. After examining the bizarre carcass, the chairman of the Zoology Department at the University of Auckland said: “I can’t think of anything it resembles.” The body was photographed and looks like a big hairy blob. Other than a few sentences, very little information has been written about the case. In 1977, the Japanese fishing trawler Zuiyō Maru discovered the Zuiyo-maru carcass off the coast of New Zealand, east of Christchurch. The crew was initially convinced that the body was an unidentified animal, but Captain Akira Tanaka decided to dump it back into the ocean. Before it was lost, a collection of photos, sketches, and samples were taken of the creature. The discovery resulted in a “plesiosaur-craze” in Japan. Analysis of the tissue indicated that the creature was most likely the carcass of a basking shark. However, the carcass holds some bizarre characteristics. It had a long neck, four large, reddish fins, a long tail, and lacked a dorsal fin. William Trubridge is a record setting free-diver from New Zealand. He is the first human to break the 100m barrier in an unassisted dive. In 2011, Trubridge won the World’s Absolute Freediver Award (WAFA) naming him best all around free-diver in the world. On December 16, 2010, Trubridge set a new world record and dove to a depth of 101 m (331.36 ft) on a single breath of air with only his hands and feet for propulsion. During the dive, William didn’t use any swimming fins, weights, and required no heavy sled. He also didn’t use any inflatable airbag to reach the surface. 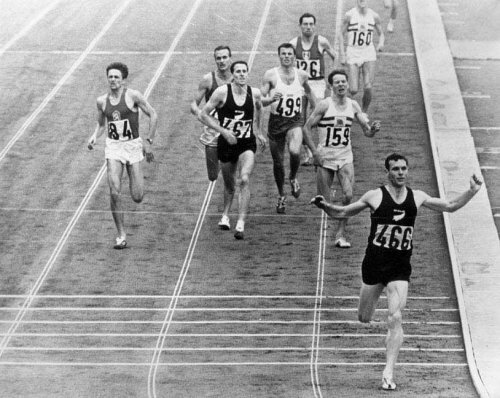 In total, Trubridge held his breath for 4 minutes, 10 seconds, from start to finish. He made the record breaking dive at Dean’s Blue Hole in the Bahamas, which is the world’s deepest known blue hole with seawater. On April 10, 2011, on the third day of completion in Vertical Blue, William Trubridge reclaimed his world record in Free Immersion and dove 121 meters in a time of 4:13. Free immersion is a bit different in that the diver can use a rope to help themselves in the decent and ascent. William Trubridge is an Apnea Academy instructor and operates a free-diving school and annual competition (Vertical Blue) at Dean’s Blue Hole. Over the last couple decades, New Zealand has become known for famous divers. Another great free-diver from New Zealand is a man named Dave Mullins. The deadliest criminal shooting spree in the history of New Zealand occurred on November 13, 1990 in the small seaside township of Aramoana. On the day in question, resident David Gray, a 33-year-old unemployed man, began indiscriminately shooting people with a scoped semi-automatic rifle. In the attack, Gray shot neighbors and members of the town killing thirteen people, including local police Sergeant Stewart Guthrie. After the massacre, Commissioner of Police John Jamieson authorized the Special Tactics Group (STG) to travel to Dunedin and locate Gray. After a long day searching from house to house, the STG found Gray in a house on the north-eastern side of the township. At around 5.50 pm, David Gray ran out of the house, shooting from the hip and shouting “Kill me!” He took several steps before being shot and knocked down by STG gunfire. He died on the way to the hospital. Police fired between 50 and 60 shots, and at least 150 police officers were involved in the operation. Three days after the incident, Gray’s house at 27 Muri Street in Aramoana was deliberately set on fire and burned to the ground. The shooting directly resulted in an amendment to New Zealand’s firearms regulations, tightening gun control laws in the country. Barry Smith was a Christian preacher and author from New Zealand. During his lifetime, Smith traveled around the world and spread the word of Jesus. He was also a conspiracy theorist who wrote eight books about the end of times prophecy. Smith was highly concerned with the New World Order, One World Government, and the Mark of the Beast. He wrote that the Mark of the Beast would be achieved by some form of modern technology, such as barcode tattoos, or a chip used to replace money. Many of Barry’s predictions are said to have come true over time. He predicted the development of the subcutaneous RFID implant, the rise of terrorism, and the Middle East Conflicts. He was a proponent of the 9/11 conspiracy theories, and claimed the attacks were orchestrated by the US federal government. Shortly before his death in 2002 (age 69), Smith forecast an imminent worldwide financial and economic “collapse.” He said the Bible indicated that the trade of the world would be moved from America to Europe. “Under the reign of the Antichrist, the American dollar will give way to the Euro dollar.” He also said that the New Zealand dollar would probably give way to an Asian dollar. New Zealand is situated some 1,500 kilometers (900 mi) east of Australia across the Tasman Sea. Because of its remoteness, the land is noted for being one of the last areas settled by humans. The isolation has also given rise to a distinct biodiversity. New Zealand has one of the most varied and unique biodiversities on earth. Birds comprise the most important part of New Zealand’s vertebrate fauna and the islands are known for a large number of endemic species, which means species that are unique to this part of the world. Of the estimated 20,000 fungi species in New Zealand, only about 4,500 are known. New Zealand also has two sub-species of endemic cetaceans, Hector’s Dolphin and its close relative Maui’s Dolphin. The Kakapo, also called owl parrot, is a species of large, flightless nocturnal parrot unique to New Zealand. It is the world’s only flightless parrot and the heaviest parrot in the world. The Kakapo is also one of the world’s longest-living birds and has a lifespan of over 60 years. Its anatomy typifies the tendency of bird evolution on oceanic islands and follows the concept of Island gigantism. The Kakapo is critically endangered. Like so many island species, the birds lost their ability to fly in the absence of mammalian predators. When humans settled New Zealand and introduced predators such as cats, dogs, rats, ferrets, and stoats, the Kakapo was almost wiped out. As of February 2012, only 126 living individuals are known, most of which have been given names. In 2009, surviving Kakapos were moved to two predator-free islands, Codfish (Whenua Hou) and Anchor islands, where they are closely monitored. Similar to other parrots, the species has been noted for their intelligence. Sports are very popular in New Zealand, and despite New Zealand being a very small nation, it has enjoyed great success in many sports, most notably rugby, cricket, sailing, netball, motorsport, climbing, and other extreme sports. New Zealand first participated at the Olympic Games in 1908, and has since sent athletes to every Summer Games. New Zealand athletes have won a total of 86 medals at the Summer Games, but only one at the Winter Games (alpine skier Annelise Coberger, 1992). A man named Ian Ferguson (canoeist) is New Zealand’s most successful Olympian. He competed in K1, K2, and K4 kayak events and won a total of four gold medals. Horseman Mark Todd was voted Rider of the 20th Century by the International Federation for Equestrian Sports. He won gold medals at Los Angeles (1984) and Seoul (1988). Danyon Loader is another famous athlete from New Zealand that won multiple gold medals. In 1996, he set World Records in the short course 200 butterfly and 400 freestyle. Loader was inducted into the International Swimming Hall of Fame in 2003. Let’s run through a quick list a notable rugby, cricket, and football stars from New Zealand. Famous rugby players include Fred Allen, Don Clarke, Sean Fitzpatrick, Grant Fox, Dave Gallaher, Michael Jones, Ian Kirkpatrick, John Kirwan, Sir Brian Lochore, Jonah Lomu, Sir Colin Meads, Graham Mourie, George Nepia, and Wilson Whineray. Some famous New Zealand cricketers include Stephen Fleming, Martin Crowe, John Richard Reid, Richard Hadlee, Lance Cairns, Chris Cairns, Danny Morrison, and Daniel Vettori. The current captain for the New Zealand national football team is defender Ryan Nelsen. Arguably the best football player in the history of New Zealand is Wynton Rufer. Rufer was named the Oceania Footballer of the Century. Some other great players include Steve Wooddin, Shane Smeltz, and Ivan Vicelich. A hot spring is a spring that is produced by the emergence of heated groundwater. There are currently hot springs on all continents and in many countries around the world. Places with an abundance of hot springs include China, Costa Rica, Iceland, Iran, Peru, United States, Taiwan, Japan, and New Zealand. The world’s largest hot spring is located in New Zealand and named Frying Pan Lake. Frying Pan Lake sits in the Waimangu Volcanic Rift Valley and has a surface area of 3.8 ha (9.3 acres), also reported at 38,000 square meters. The average depth of the hot spring is 6 meters (19.6 feet), but it reaches the depth of 20 meters (65.6 feet) in places. It is a wonderful place to visit and a marvelous example of volcanic activity. You might wonder what geological event created the massive hot spring. On June 10, 1886 the Waimangu Volcanic Rift Valley was created by the eruption of Mount Tarawera, on the North Island. The lake is currently fed by numerous acid springs and sits at a temperature between 45 and 55°C (113-131°F). 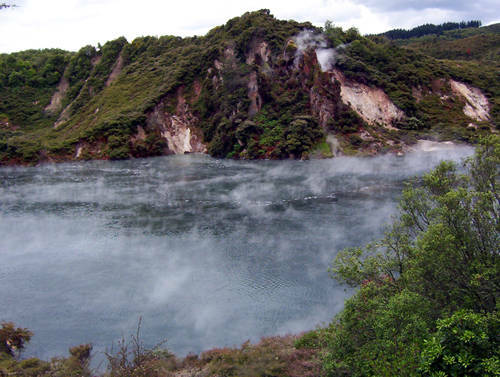 The 1886 Mount Tarawera eruption also created the Waimangu Geyser, which was located near Rotorua in New Zealand. Rotorua is a famous city on the southern shores of Lake Rotorua. The Waimangu Geyser was the most powerful geyser in the world from 1900 to 1904. It was created after the eruption opened a 14km-long (8.75 miles) fissure down the mountain and through Lake Rotomahana. The geyser was first seen erupting in 1900 and the explosion of water was observed reaching up to 460 meters (1,500 ft) in height. The geyser attracted worldwide interest in the early 1900s and was a popular tourist destination. On November 1, 1904, the Waimangu Geyser became extinct as the result of a landslide which changed the water table in this area of New Zealand. Due to the mild maritime climate of New Zealand, the land is covered with lush forest. The country also has giant mountain peaks, which were formed by the tectonic uplift and volcanic eruptions. For this reason, many areas of New Zealand are extremely remote and isolated. For centuries, the people of New Zealand have reported some unusual creatures on the islands. Let’s take a look at some of the most popular crypids of New Zealand. Since the late 1990s, several big cat sightings have been reported in parts of New Zealand, on both the North and South Islands. There have been unverified panther sightings in Mid-Canterbury near Ashburton and in the foothills of the Southern Alps, but no physical evidence has been discovered. The Kumi Lizard is a cryptid reptile, possibly a giant monitor lizard, which allegedly once lived in New Zealand. The Kumi Lizard is said to be 1.5 meters (4.9 feet) long and is similar to the giant extinct Australian lizard, Megalania. The Moehau is reported to be a large, hairy hominid living in the Coromandel-Moehau ranges of New Zealand’s North Island. The most common explanation for the Hairy Moehau is that it is a gorilla that escaped from a ship in the 1920s. Toangians is the name of another ape-man that has been reported in New Zealand. The Waitoreke is an otter/beaver-like animal said to live on the South Island. Probably the most intriguing cryptid from New Zealand is the Poukai, which was a monstrous bird that is said to have eaten people. According to Sir George Grey, an early governor of New Zealand, Hokioi (Poukai) were huge black-and-white predators with a red crest and yellow-green tinged wingtips. If the Poukai was related to the Haast’s Eagle, then it is possible that the legends could be true. The Haast’s Eagle was a species of massive eagles that once lived on the South Island of New Zealand. The species is the largest eagle and true raptors ever known to have existed. The total length of the bird was estimated to have been up to 1.4 m (4 ft 7 in) in females, with a standing height of approximately 90 cm (2 ft 11 in). Haast’s Eagles preyed on large, flightless bird species, including the moa, which was often fifteen times the weight of the eagle at 300 pounds (140 kg). It is estimated that the Haast’s Eagle attacked at speeds up to 80 km/h (50 mph) and could have easily killed an adult human. The birds did not officially become extinct until around 1400. New Zealand is known for its extreme sports, adventure tourism, and strong mountaineering tradition. Outdoor pursuits such as cycling, fishing, swimming, running, tramping, canoeing, hunting, and surfing are popular. The Catlins Coast comprises an area in the southeastern corner of the South Island of New Zealand. If you enjoy scenic beauty, hiking, and the freedom of isolation, this is the place for you. The Catlins Coast is a rugged area that features a scenic coastal landscape and dense temperate rainforest, both of which hold many endangered species of birds, most notably the rare yellow-eyed penguin. The coast is exposed to wild weather and large ocean swells, which often attract big-wave surfers. Due to the weather, the Catlins Coast has been home to numerous shipwrecks, which has intrigued divers and treasure hunters. The relatively isolated location of the Catlins Coast is a delight for surfers who can find undiscovered hot spots. The area has been described as a “treasure trove of uncharted wave formations.” Some noted locations are Kaka Point, Nugget Point, Cannibal Bay, Long Point, and Catlins River Mouth. Be sure to visit the cliffs of Slope Point if you are on the Catlins Coast. There is no road to Slope Point and it must be reached by a 20 minute walk following dilapidated yellow markers. The rugged, scenic coastline of the Catlins features sandy beaches, blowholes, a petrified forest at Curio Bay, and the Cathedral Caves, which visitors can reach at low tide. The caves are only accessible 2 hours either side of low tide and are one of the most popular tourist destinations in New Zealand. The Catlins Coast consists of high cliffs, up to 200m (660 ft) in height. For this reason, many of the area’s rivers cascade and form large waterfalls, most notably the iconic Purakaunui Falls on the short Purakaunui River. The falls are isolated by native bush and fall 20m (66 ft) in three tiers. The landscape of the Catlins is featured in many poems by celebrated poet Hone Tuwhare and is like nothing found in other parts of the world. During World War II, the people of New Zealand felt safe in the fact that they were isolated and a long distance from the war in Europe. However, in the summer of 1940, the German merchant cruiser Orion was ordered to place 228 mines in four separate areas around New Zealand. At this time in history, the RMS Niagara was an ocean liner that maintained a service from Auckland, New Zealand, to Suva and Vancouver, Canada. The vessel was initially launched on August 17, 1912 and given the nickname of “the Titanic of the Pacific,” but after the RMS Titanic sank, it was renamed “Queen of the Pacific.” RMS Niagara was just 55m shorter than Titanic. On June 19, 1940, the RMS Niagara was hit by a mine near Auckland and sank in 121 meters (397 feet) of water. No lives were lost, but a secret and large consignment of gold and weapons from the Bank of England sank with the ship. Also, the passenger’s valuables were lost. In the early 1940s, a series of recovery attempts were made to locate the gold. In one case, the Claymore successfully recovered more than eight tones of gold. In all, 555 gold bars were found by the Claymore. As of 2011, five gold bars remain in the wreck, estimated to be worth $1.2 million New Zealand dollars. People have attempted to recover the gold, but it remains lost. New Zealand is officially recognized as an island country, but it sits on a massive submerged continent known as Zealandia. The New Zealand continent is a nearly submerged fragment of land that sank after breaking away from Australia. New Zealand is the largest part of Zealandia above sea level, followed by New Caledonia. The sunken continent is larger than Greenland or India, and almost half the size of Australia. It is unusually slender, stretching from New Caledonia to beyond New Zealand’s sub-Antarctic islands. Zealandia supports inshore fisheries and contains New Zealand’s largest gas field, near Taranaki. In 1768, Captain Cook received specific instructions to find the fabled land of Terra Australis Incognita, the great southern continent thought to be hiding somewhere in the South Pacific. History says Cook failed, finding only the finger of New Zealand. However, GNS geologist Hamish Campbell says Cook might have succeeded and found the sunken land of Zealandia. This is a controversial claim because it says that the entire continent of Zealandia and New Zealand was once underwater. To support his theory, Campbell used evidence from the Ruahine Range, which used to be submerged. The theory would disprove important facts surrounding the creation of New Zealand. It would help answer the question of what happened to the mammals absent from New Zealand’s native fauna. “What we’re saying is that it is possible that New Zealand’s native flora and fauna is derived from ancestral stock less than 25 million years old.” Many people have dismissed the theory for a number of reasons. Some have cited the history of the tuatara, which is a reptile alive in New Zealand, thought to be a rare remnant of the dinosaur age. In 1977, Air New Zealand decided to offer an Antarctic sightseeing flight from Auckland Airport to Antarctica and then back via Christchurch. The flight gave individuals the opportunity to view unexplored portions of Antarctica. Many people in New Zealand and around the world saw TE-901 as a great opportunity and quickly signed up for the voyage. On November 28, 1979, the fourteenth flight of TE-901 collided with Mount Erebus on Ross Island, Antarctica, killing all 237 passengers and 20 crew on board. The initial investigation into the accident concluded that it was caused by pilot error, but it was later determined that the flight crashed after its coordinates were adjusted and the crew was not informed. Had the pilots been informed of the changes, the crash could have been avoided. The unexpected flight plan adjustment caused the aircraft to be manually re-routed into the path of Mount Erebus. After a long search, both the cockpit voice recorder and the flight data recorder were discovered. The voice recorder indicated that the crew believed they were flying over McMurdo Sound, well to the west of Mt Erebus, when in reality they were flying directly at the mountain. A collection of pictures were taken seconds before the collision that show the mountain with clear visibility and well beneath the cloud base. This fact has confused some people, as the pilots of the aircraft should have been well aware that they were in danger. A conspiracy has evolved around the case and some people in New Zealand feel the government has kept important facts secret. After the crash, the phrase “an orchestrated litany of lies” entered New Zealand popular culture. Stories emerged of passengers who won tickets to the ill-fated flight or received them as gifts. The accident remains New Zealand’s deadliest peacetime disaster. When searching for the most famous person born in New Zealand, Edmund Hillary stands out. In 1919, Hillary was born in Auckland, New Zealand. While in secondary school, he became interested in mountaineering and made his first major climb in 1939, reaching the summit of Mount Ollivier. On May 29, 1953, Hillary and Nepalese Sherpa mountaineer Tenzing Norgay became the first climbers confirmed to have reached the summit of Mount Everest and survived. The feat propelled Hillary to international stardom and he was named one of the 100 most influential people of the 20th century. Following his ascent of Everest, Hillary devoted most of his life to helping the Sherpa people of Nepal. He funded many schools and hospitals in the area. In his career, Hillary scaled ten other peaks in the Himalayas. He also reached the South Pole and was the first to reach the Pole overland since Amundsen in 1911 and Scott in 1912. Despite the danger of climbing enormous mountain peaks, Hillary’s most notorious near-death experiences have come from plane crashes. 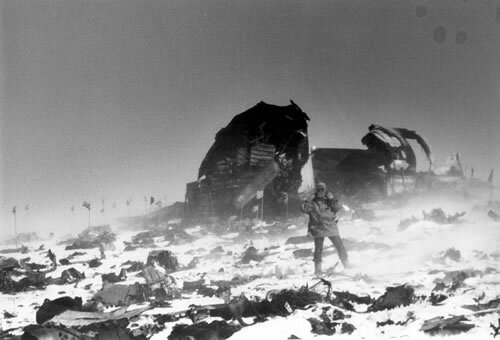 Edmund Hillary narrowly missed becoming a victim of the 1960 New York air disaster, having been late for his flight. Between 1977 and 1979, Hillary commentated aboard several Antarctic sightseeing flights operated by Air New Zealand. He was scheduled to commentate on the November 28, 1979 flight that crashed into Mount Erebus, but was instead replaced by his close friend Peter Mulgrew, who died in the accident. In 1992, Edmund Hillary appeared on the New Zealand $5 note, making him the only New Zealander to be on a banknote during their lifetime. In 2006, Edmund was highly critical of the decision not to try to rescue David Sharp, an Everest climber who died on the mountain, saying that it is unacceptable to leave another climber behind. On January 11, 2008, Edmund Hillary died of heart failure in Auckland City Hospital. He was 88-years-old. Baldwin Street, in Dunedin, New Zealand, is considered the world’s steepest residential street. It is located in the suburb of North East Valley, 3.5 kilometers (2.2 mi) northeast of Dunedin’s city centre. Baldwin Street runs east from the valley of the Lindsay Creek up the side of Signal Hill towards Opoho. The road has an average slope of slightly more than 1:5 at its maximum. The slope of Baldwin Street rises about 1:2.86 (19° or 35%), which is an elevation change of 1 meter for every 2.86 meters traveled. The street was developed in the middle of the 19th century as part of a wider grid system. Baldwin Street is the venue for a collection of annual events in New Zealand, including the Baldwin Street Gutbuster, which involves running from the base of the street to the top of the hill and back down. Since 2002, Baldwin Street has been the site for an event which involves rolling over 30,000 Jaffas (little chocolate balls) down the hill. The road has become an area for thrill-seekers and dangerous stunts. In March 2001, a 19-year-old University of Otago student was killed when she attempted to travel down the street inside a wheelie bin. The bin collided with a parked trailer, killing her instantly. On January 2, 2010, Cardrona stuntman Ian Soanes rode down Baldwin Street on a motorcycle on one wheel.